4822 Meat Chopper boasts a 1 1/2-H.P. motor and a capacity of 12 to 20 lbs. per minute with continuous chopping action, making it ideal for "on demand" chopping. Tool-less cleaning is an added benefit to keep up with frequent use and food-safety standards. Make juicy and tender sausages and croquettes. 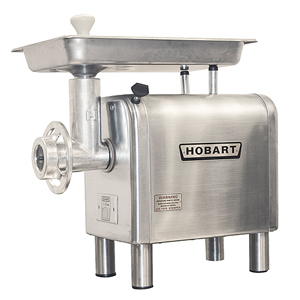 HOBART Meat Mincers handle the toughest assignments with ease, ideal for continuous service in high-volume and on-demand processors of fresh or tempered meats. There is no mashing of meat, it comes out clean cut with all its natural colour and flavour. Capacity (4.5 mm plate): 7,3 kg per min. Complete with 1,5 h.p. motor, stainless steel housing, stainless steel feed pan, tinned steel worm, cylinder and adjusting rung, plastic stamper, cylinder wrench, motor overload protection and no-volt-release, push start /stop button, 137 mm feet, supplied with 1 x 4 bladed knife, 1 x 3 mm plate.